New year, new clothes, new you. Regardless if you’re trying something totally different this year, just refreshing your wardrobe or a mix of both, now’s the time to stock your closet. 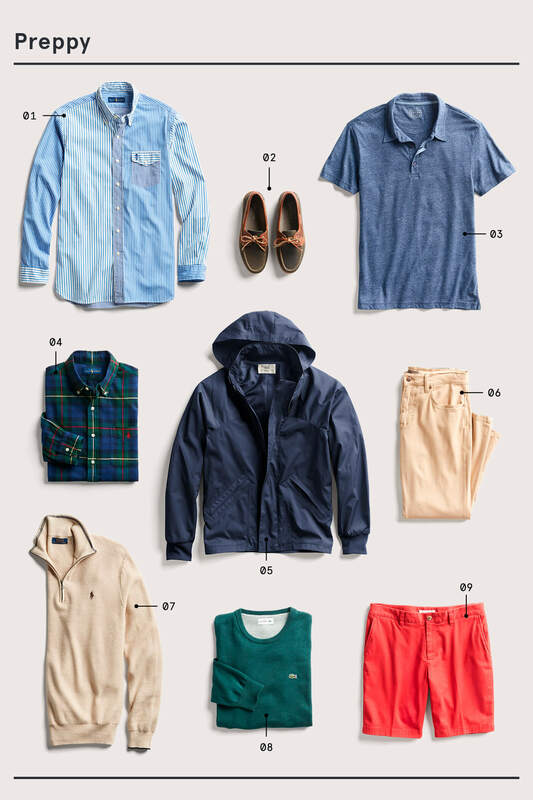 From building up basics that consistently come to the rescue to swapping in pieces with distinct personas, these five style guides will help you own whatever look you’re going for, all year long. 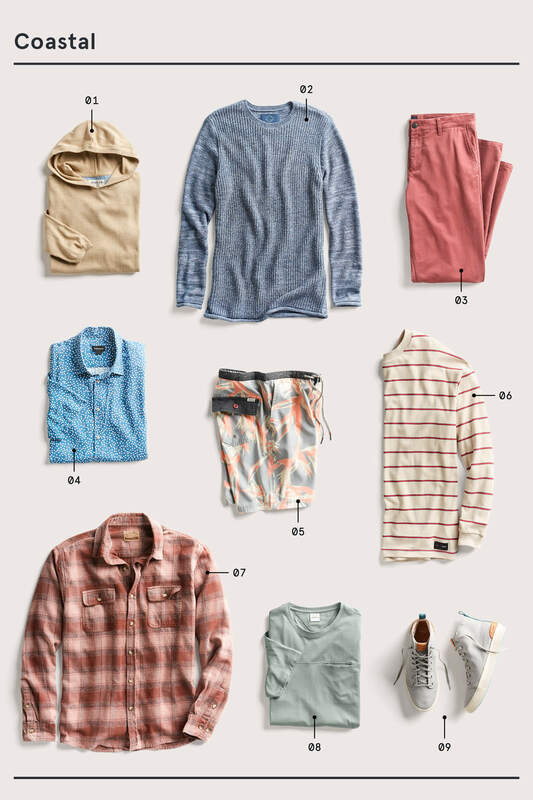 See all five styles below: rugged, refined, coastal, preppy, modern. If you’re always outdoors, or into the outdoorsy aesthetic, you need a foundation of durable pieces built to last. 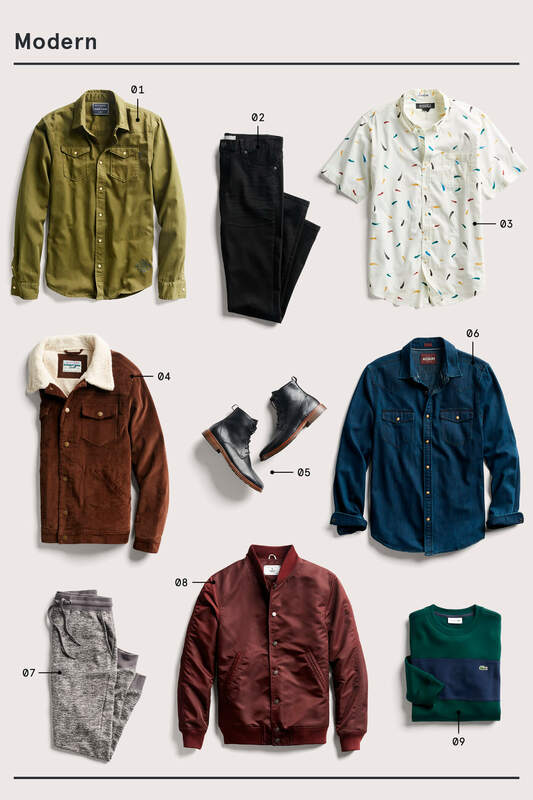 Based on vintage workwear and military-inspired essentials, you’ll find styles that are functional and look good together or separate. Puffer Vest: Keeps in the heat while allowing you to move freely. Add your favorite flannel underneath. Half-Zip Sweater: Has the same versatility as your favorite crewneck with some ventilation if you overheat. Raw Denim: Aside from the go-with-everything indigo, it’s fun to break them in when you know every crease is based on how you move. Corduroy Shirt: Works great as a mid-layer, and its rich fabric wears in nicely while adding a cool textured element. Chukka Boots: Sturdy, comfortable and pulls off that rustic aesthetic in an effortless way, regardless if you’re dressed up or down. Chunky Cardigan: Can double as a jacket with heavyweight staples underneath. You choose how loud or subtle you want it to be. Colored Jeans: Earth tones mix up the everyday and are easy to match back to (try greens, tans and navys). Henley T-Shirt: A step above a basic tee and perfect for those times when you need different tiers of warmth. Flannel Shirt: Cozy, comes in a ton of plaids and patterns and readily pairs with tees and under jackets. You like to keep your look on the dressier side, even during down time. 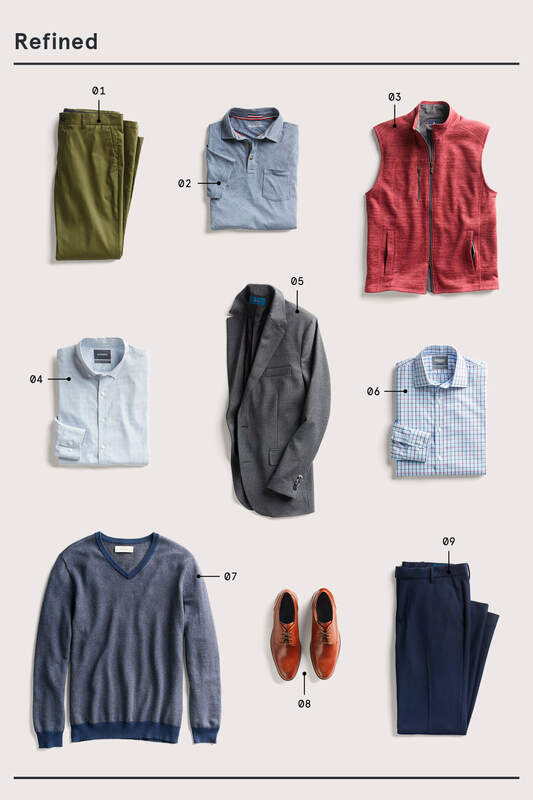 Create a collection of trustworthy staples that balance that fine line between smart and casual, and work well together so you can easily power through your mornings. Colorful Pants: An easy way to refresh your everyday look. Trade in your usual pair for these, and keep the rest business as usual. Performance Polo: A level above a t-shirt but equally relaxed with invisible technology. Go from the golf course to the market in stride. Fleece Vest: Allows you to move freely but still keeps you warm without overheating. Equally as cool over a flannel or a gingham dress shirt. Soft-Washed Shirt: Tailored meets casual. Wrinkled to perfection and feels like you’ve owned it forever. Neutral Blazer: Instantly sharpens up your outfit overall and works year-round. If it’s extra cold, just throw a topcoat on top. Dress Shirt: Once you nail your fit, you should have an arsenal of checkered shirts in your closet for work, dates and dinners. V-Neck Sweater: So many ways to wear it: alone, over a collared shirt, layered with a jacket. It also adds a casual spin to a blazer. Leather Oxfords: Worth the investment once you see how much wear you get out of them. Think work, weddings, date nights and casual hangs. Tailored Pants: Half a suit is more versatile than you think. Dress them down with minimal sneakers and a solid sweatshirt. A chill vibe is a major part of your lifestyle, and you’re at your happiest when close to the beach. It’s time to bring the vacation mood to your closet with easy fits, a washed out color palette an a “float-on” attitude. Hooded Sweater: It’s your favorite loungewear, taken up a notch. Add some joggers for a cozy night in or pair with dark denim if you’re heading out for the night. Textured Sweater: Sometimes you need more than a t-shirt, but less than a jacket and that’s where this pieces comes in. Garment-Dyed Chinos: Color = fun. Now’s your chance to experiment with your favorite shades in pants that have been washed for superior softness. All-Over Print Shirt: You can pick a big, bold print or something subtle—either way, it breaks up the usual suspects in a good way. Swim Shorts: It’s good to have a pair handy since you never know when you might pull over and take a dip. A fun print looks good out of the water, too. Striped T-Shirt: Comfy, easy to wear and packable. Time to ride the wave of stripes, which look good on everyone and fit into any atmosphere. Flannel Shirt: Supersoft, easy to toss over t-shirts or ball up and toss into a bag while traveling. Pocket T-Shirt: Vary your rotation of essentials with beachy colors and details, such as pockets. High-Top Sneakers: Hit the pavement in shoes that provide support and look great at the same time. Plaids, stripes and collegiate colors are a big part of the all-American aesthetic. Pack your wardrobe with a few signature pieces made to endure trends and effortlessly jump across different styles. Striped Dress Shirt: Fine lines generally give off a nautical-preppy feel. Tone down the business look with soft-washed chinos or turn it up with tailored pants. Boat Shoes: Slide into a pair and look the part even if you’re not on deck. Neutral colors are good for office days while bright hues say vacation. Linen Polo: Both sporty and sharp. You’ll always look like you put in a little effort as you go from the office to dinner. Oxford Shirt: Fits the classic bill, yet seamlessly slides into any guy’s closet. Double down on the prep with a navy blazer. Performance Bomber: All-weather ready with clean-lines and no unnecessary bells and whistles. Just zip up and go. 5-Pocket Pants: This go-with-everything pant goes everywhere too. From work to weekend, this hard-working staple takes the effort away. Mockneck Sweater: The perfect in-between layer that says elevated collegiate without being stuffy. Add a colorful tartan shirt for the perfect combo. Crewneck Sweater: Color is everything, and nothing says East Coast heritage like a bold green. Add a collared shirt and let the iconic vibes sink in. Soft-Washed Shorts: Stand out from the crowd as you flex your sartorial powers at the beach, on vacation and all around town. Edgy, neutral, clean-lines—these are the core elements of what make up this sophisticated style. Opt for well-crafted pieces made with impeccable fabrics and purposeful details. Twill Shirt: Details matter when it comes to differentiating what goes up top. Even something as small as flap pockets can switch up the norm. Black Slim Jeans: Think of these as a five-pocket dress pant but more comfortable. A slim fit isn’t too tight and keeps your look streamlined. Printed Shirt: A cool motif is a nice change of pace, adds interest and works just as well under a suit as it does with joggers. Corduroy Jacket: Rich texture in a timeless style adds character. This piece will make you look forward to those chilly days. Leather Boots: An endless list—reliable, supportive, tough, good-looking, comfortable, versatile. Should we go on? Denim Shirt: Wear it alone or as a second layer, and you can even double up on your denim as long as you vary the washes from light to dark. Knit Joggers: Welcome to the next level of sweatpants. A prime star in the world of athleisure, and ready to go the distance. Bomber Jacket: Showing no signs of slowing down, an unexpected color only adds to its notoriety. It’s the fastest way to upgrade a white t-shirt and jeans. Striped Sweater: Classic for the win. Fits great, feels warm and makes the cut for casual Fridays. 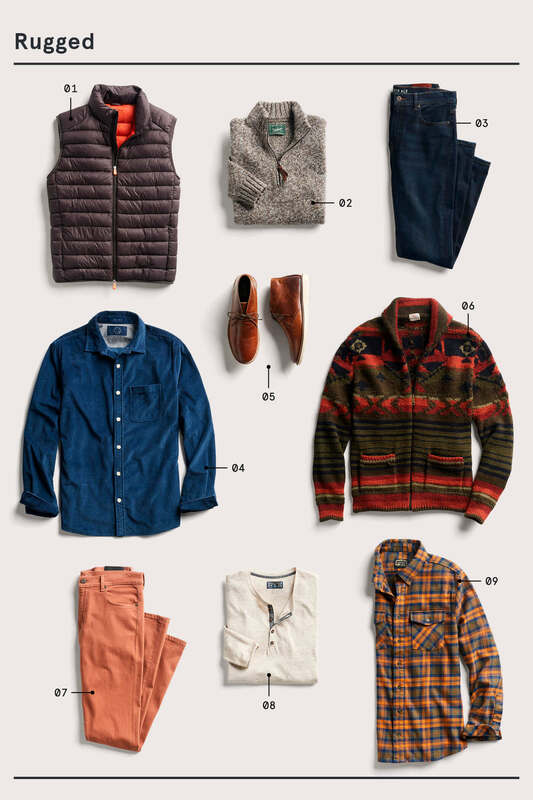 Inspired by the style breakdowns above, or in need of a closet overhaul? Ask a Stylist to help you start collecting the building blocks to your year of style.